Devon-based British organic food company Rod and Ben’s has launched a new line of soups for winter and autumn. These new soups aim to appeal to consumers as comfort food, especially when the weather turns cold during winter. The new range of soups includes “Spicy Parsnip,” “Farmhouse Vegetable,” “Leek and Potato” and “Smoked Haddock Chowder.” The first variety is made by mixing the right amounts of leeks, potatoes, parsley, carrots and onions. These ingredients are all sourced from Rod and Ben’s farm, where everything is organically grown. This particular soup was created with the help of food expert and author Carole Handslip. The second soup variety is made from fresh haddock caught from the Cornish shore. The haddock is then smoked at the Tregida family-run smokehouse. This new recipe, the “Smoked Haddock Chowder,” has recently been named a “highly commended” meal by the “Soil Association Organic Food Awards of 2011.” The commendation certainly is proof that the chowder is an impressive one. All of Rod and Ben’s soups have been made using simple recipes. What results from these simple recipes are products that have their colour, texture and flavour preserved. 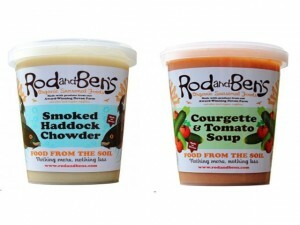 The new line of soups from Rod and Ben’s are all wheat-free and gluten-free. In addition to this new line, Rod and Ben’s will still continue to produce its line of limited edition soups, which include “Vegetable Mulligatawny” (for September), “Broccoli & Stilton” (for October), “Cream of Cauliflower” (for November) and “Beetroot and Cumin” (for December). Rod and Ben’s winter soups are now available at independent food shops, farm shops and delicatessens all over the country.